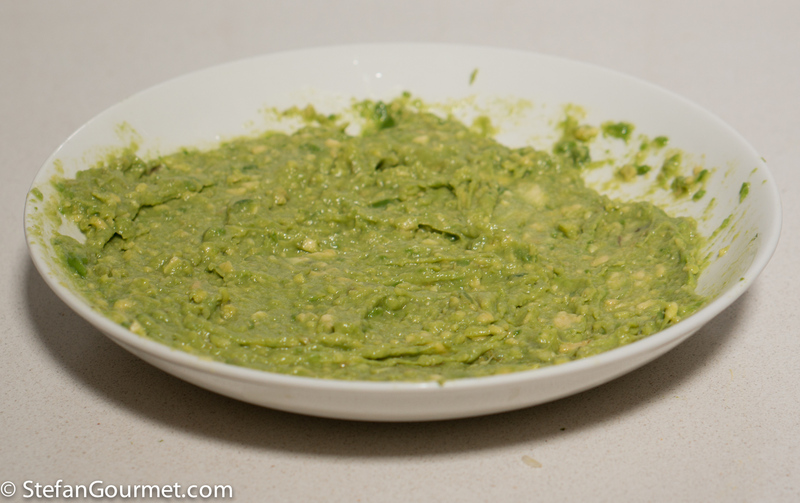 Guacamole is a dipping sauce that you are probably all familiar with. You get the best guacamole by making it at home from fresh ingredients rather than buying it in a store.As guacamole is an avocado-based sauce, it is the most important ingredient. Of course the avocado must be ripe. Luckily avocados are fruits that ripen after the harvest, so if they are not ripe yet you can simply wait for that to happen. (It will happen faster with a banana nearby.) 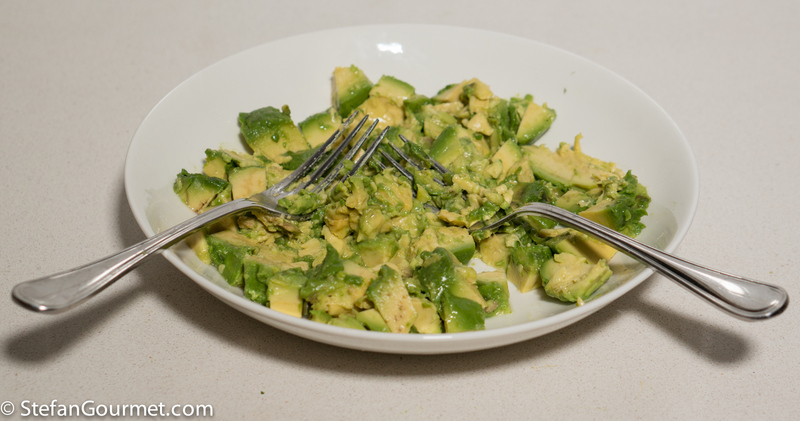 To get a more interesting texture, use a fork to mash the avocado rather than a blender. 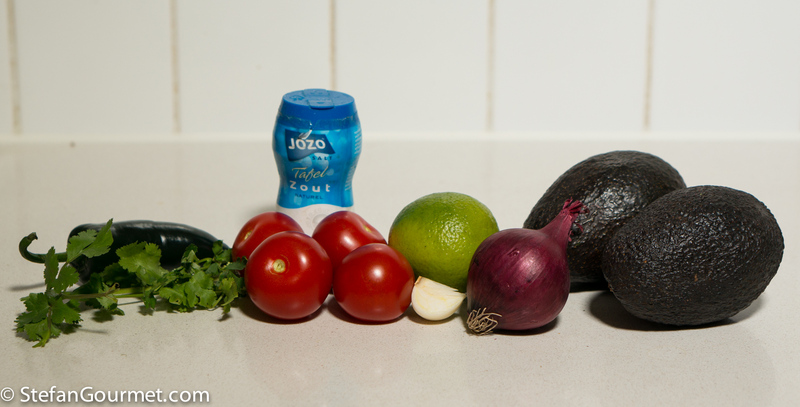 Apart from avocado the other ingredients that are absolutely required are salt and lime juice. The lime is need to prevent oxidation (the guacamole turning brown) and to balance out the flavor. 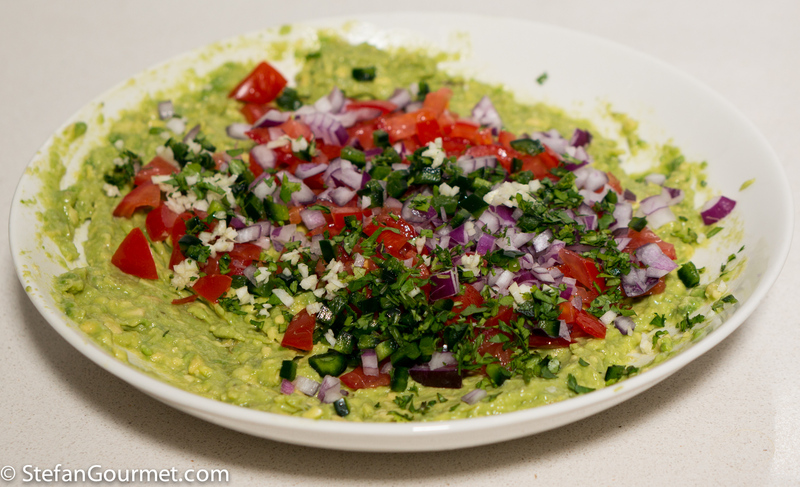 Other ingredients can be used to give the guacamole more flavor. Here is my version. Mince the garlic, cilantro, jalapeño, and red onion. Seed and finely chop the tomato. 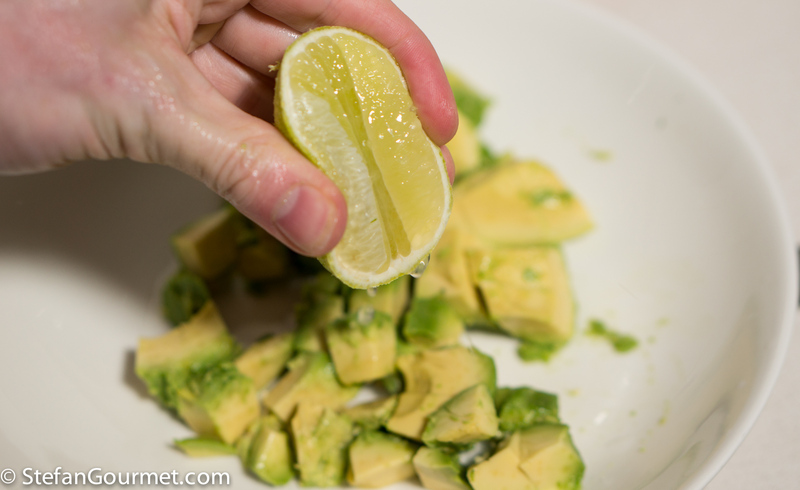 Have a lime ready before you open up the avocado, because it will turn brown pretty quickly without the lime juice. 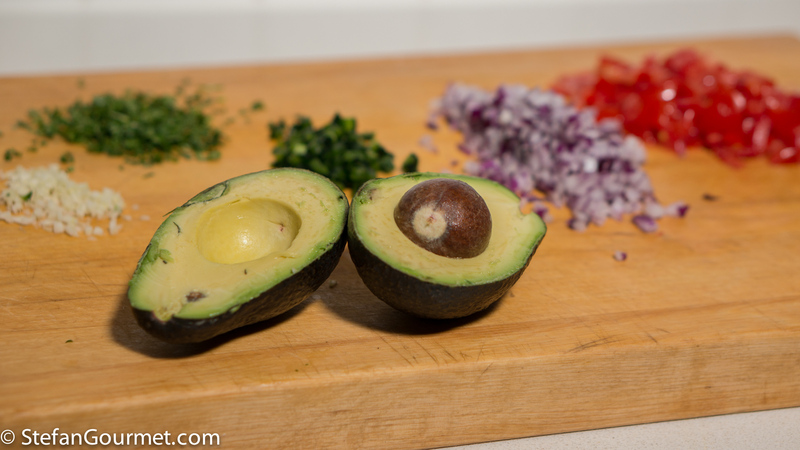 Cut around the seed of the avocado lengthwise, and remove the seed. Scoop out the flesh with a spoon (this should be easy if it is ripe). Put the avocado flesh on a plate and immediately sprinkle with the freshly squeezed juice of 1/2 lime. …until it is a coarse puree. Add tomato, jalapeño, red onion, cilantro, and garlic. Stir to mix, then season to taste with plenty of salt. The avocado will keep in the refrigerator for several days, but serve it at room temperature. Garlic is an unusual twist. Not to be found here, guac with garlic I mean. Interesting ingredients. I wonder what Mel uses? Iour pert of the world we use Roma tomatoes, no onion, no garlic. We usually have three flavors Mild (just a little jalapeño), spicy (about 3x of mild) and Hot (a lot of peppers). You can substitute tomatillos for the Romas. It’s a bit more tangy. Since it doesn’t keep well, we normally eat all of it. Your recipe seems like a good one. Keep posting. Thanks Cecil, interesting to see you have a different version. Tomatillos would be very nice, but are hard to find (and expensive if I can find them). 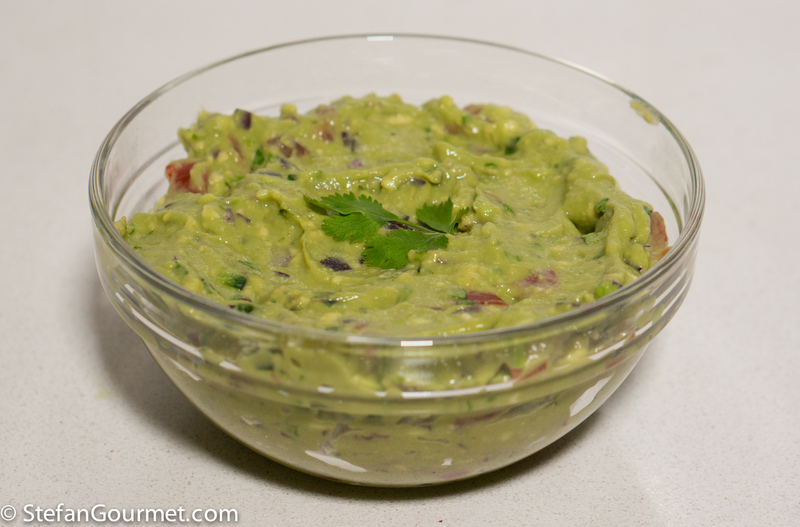 I generally don’t like guacamole to be very hot, as it is nice to add a ‘cool’ part to an otherwise spicy dish. Looks good. I failed at making guacamole so I will pin this. My daughter can eat this entire bowl herself! When I make guacamole I need to add at least two extra avocados for her. Our recipe is pretty much the same. I will attempt this to see if it is better than my mushy peas. This is really nice. I like the chunky texture and the other vegetables you have included. It is what I aim for with my mushy peas, I include chopped celery and carrots. The attempted comparison comes from Peter Mandelson part of the New Labour Blairite aristocracy, representing a northern working class town, reputedly asked for “some of that guacamole” to go with his fish and in his local chippy. I don’t suppose I could tempt you into a discussion on politics though. Pity. The best prepared food comes from quality ingredients. The more fresh, the better! And if you can go with local, organic produce, there’s just a sweeter taste to it all. Thanks for sharing this recipe! Ciao Paola, I hope you will try to make guacamole again. I’m happy with the results of our election! I just love it that you’re willing to experiment with my native cuisine: Southwestern American/Northern Mexican. I love your take on this! It makes me hungry for some nacho chips.